Despite the recent publicity and popularity that the blockchain community has been receiving, developers in the space are still extremely few and far between. A huge goal of ours is to have a thriving community, not only behind our protocol, but in general. We want to help create talented developers for us, for all our friends in the space, and for the hundreds of new blockchain companies out there. One of the ways we’re forging this environment is by having live workshops, as seen below, where we teach technical blockchain fundamentals. Alain Goldman, one of our developers, teaching Truffle to a class at Microsoft. In that spirit, we’ll also be putting some tutorials online- doing what we can to help this community of developers grow. Here’s a Truffle and Rinkeby tutorial, made with Truffle v3.4.9 (core: 3.4.8) and Solidity v0.4.15. If you’re a Windows user, we recommend installing and using Truffle via Windows PowerShell or Git BASH. These two shells provide features far beyond the standard Command Prompt, and will make your life on the command line much easier. 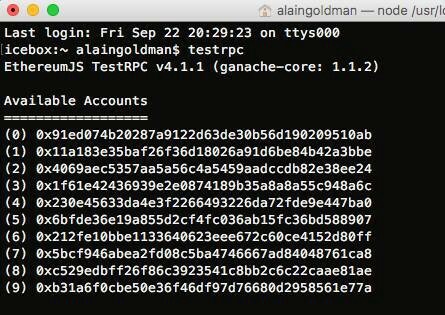 Now, while Testrpc is running in a brand new terminal, we can go ahead and install Truffle, initialize and app and run it. Here we are using a shortcut truffle unbox react which does an initialization and adds the necessary modules for react. If you want to have a pure installation you should instead run truffle init inside of the folder you created. Go into your Truffle folder. Okay, let’s fill out the migration. Now, let’s go ahead and make our app have a touch event to trigger both a get and a set function from that contract. Go to truftest/src/App.js and add this. What we get is two boxes that when clicked execute our contract and console.log the result. But what if we didn’t want to run the app inside of Testrpc? For that we will need Mist and Rinkeby. Rinkeby is the test EVM. Lets go ahead and get setup for that next. Close the Testrpc terminal and close the Truffle server. Node.js x7.x (use the preferred installation method for your OS). Electron v1.4.15 cross platform desktop app framework. Gulp build and automation system. Make sure you have yarn installed. You can get it here. Quick reminder to make sure you closed the Testrpc terminal and the Truffle server. 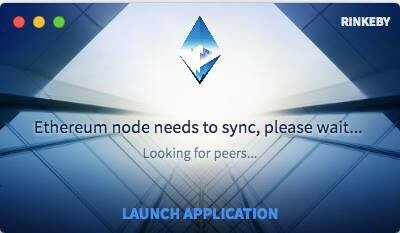 Launch the application in test network. Wait for past blocks to download. (On the bottom left Mist is downloading the past blocks. Wait for this to update). Write down your Ethereum address, we will need this later in this tutorial. If you want to read more about mist you can do so here. For now close both terminals. The one running meteor and the one running mist/electron. Make sure to close both terminals. In order to use the test network we have to have test Ether, which we can’t just print out. Log into github, create an account if you dont have one. Create a new public gist and only put your Ethereum address in there. Get free Ether from https://faucet.rinkeby.io/. Paste the url from the gist file into the faucet page. Make sure to close the terminal. Please don’t forget to replace my wallet with the wallet you got from Mist/Electron. This will ask you for the password you gave Mist/Electron. Please dont forget to replace the from section in this file to your Ethereum address you scored from Mist/Electron. Now we just have to migrate the contract onto Rinkeby. This is going to ask for the password you gave Mist/Electron. 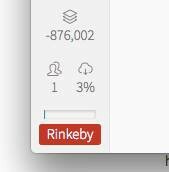 If you want to view the current state of your contracts on the Rinkeby test network go to this URL. Congratulations We Set It Up!! Hopefully this tutorial provided some useful information for you. Let us know what else you’d like us to cover and we’ll try to do it in either a live workshop or an online tutorial just like this.